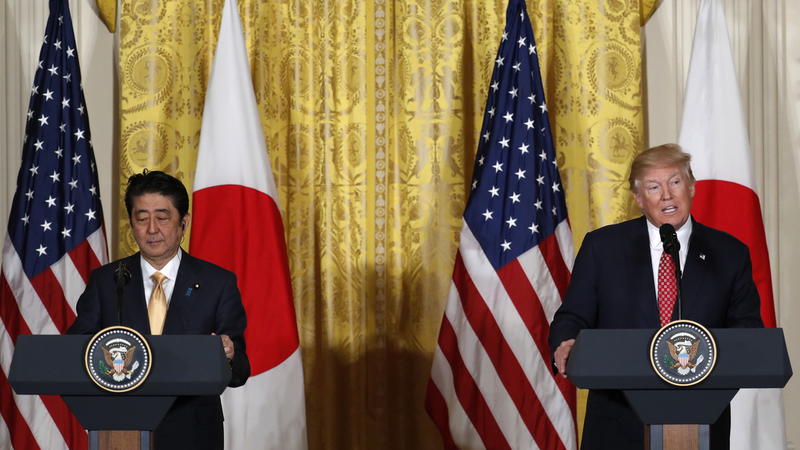 WATCH: President Donald Trump And Japanese Prime Minister Shinzo Abe Hold Press Conference : The Two-Way The U.S. president and Japanese prime minister used their news conference to celebrate the allies' bilateral cooperation. The joint address marked an intermission in their multiday diplomatic talks. President Trump and Japanese Prime Minister Shinzo Abe hold a joint news conference in the East Room of the White House on Friday. At a joint news conference Friday, President Trump and Japanese Prime Minister Shinzo Abe sought to shed any perceptions of mistrust between two countries that have been longtime allies. In no uncertain terms, both leaders upheld their friendly relations — both diplomatic and personal — as an alliance with a bright future. The U.S.-Japan friendship is the "cornerstone of peace and stability in the Pacific region," President Trump told reporters gathered in the East Room at the White House. The news conference capped a morning of discussion between Trump and Abe in the Oval Office, and it anticipates a round of golf they plan to play Saturday at Trump's Mar-a-Lago resort in Palm Beach, Fla.
During Trump's second visit from a foreign leader since taking office, both men covered some of the lingering questions Trump has raised about their countries' alliance — from security agreements to monetary policy. "Bilateral cooperation is essential," Trump said — a point echoed later by Abe, who promised to "deepen bilateral relations" by establishing a cross-Pacific dialogue by their respective seconds-in-command. Key to that cooperation, both leaders asserted, will be Japanese investment in the United States. That includes a promise from Abe that Japanese automakers will create jobs stateside, and that Japanese money and technical know-how will help the U.S. infrastructure spending promised by Trump — including a lighthearted pitch for the maglev trains that have become iconic in Japan. As NPR's Elise Hu reports, that promise is part of a give-and-take Japan hopes to effect with regard to another key issue. "To get the security Japan wants, Abe will present a package of ideas for investing as much as $150 billion into U.S. infrastructure, including high-speed rail projects. President Trump made improving infrastructure a key campaign pledge." Those issues of security, mentioned by Elise, were also brought to the fore Friday by both leaders. "Thank you for hosting our armed forces," Trump told Abe at one point — a shift in tone from his presidential campaign, during which Trump lamented that Japan and other allies "do not pay us what they should be paying us, because we are providing a tremendous service and we're losing a fortune." Elise notes that U.S. Defense Secretary James Mattis also took a friendlier tack in his visit to the country last week, when he said that "Japan has been a model of cost-sharing, of burden-sharing." On Friday, Trump similarly emphasized Japan's security in the region, mentioning his "very warm conversation" Thursday with Chinese Xi Jinping — and the good relations that may come of it — as being of long-term benefit to Japan. He and Abe both asserted the importance of "freedom of navigation" in the South China Sea, where Japan has been unnerved by perceived Chinese encroachment. Of course, even at a conversation nominally about trans-Pacific relations, Trump could not escape questions about his travel ban, which has been put on hold while a lawsuit works its way through federal court. On Thursday night, the 9th U.S. Circuit Court of Appeals upheld a temporary restraining order that suspended the ban. "We will continue to go through the court process and, ultimately, I have no doubt we will win that particular case," Trump told reporters Friday. He also suggested the administration would be announcing something related to "additional security for our country" — though he did not clarify. Meanwhile, however, he was content to laud the "good bond, good chemistry" he is developing with Abe. "I'll let you know if it changes," Trump added, "but I don't think it will."